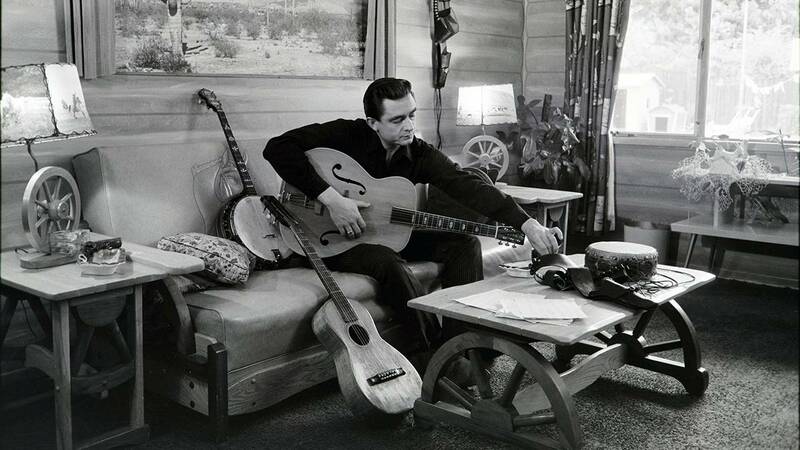 Johnny Cash at his home in California, 1960. PASADENA, CA; FEBRUARY 1, 2019 -- Step back in time and journey through the compelling history of a truly American art form when COUNTRY MUSIC, a new eight-part, 16-hour film directed by Ken Burns, and produced by Burns and his long-time collaborators Dayton Duncan and Julie Dunfey, premieres Sunday, September 15 through Wednesday, September 18, and Sunday, September 22 through Wednesday, September 25 at 8:00-10:00 p.m. ET. The first four episodes will stream on station-branded PBS platforms, including PBS.org and PBS apps, timed to the Sunday, September 15premiere and the second four timed to the broadcast of Episode 5 on Sunday, September 22 (each episode will stream for a period of three weeks). PBS Passport members will be able to stream the entire series for a period of six months beginning Sunday, September 15. COUNTRY MUSIC explores crucial questions –– “What is country music?” and “Where did it come from?”–– while focusing on the biographies of the fascinating trailblazers who created and shaped it — from the Carter Family, Jimmie Rodgers, Bill Monroe and Bob Wills to Hank Williams, Patsy Cline, Johnny Cash, Merle Haggard, Loretta Lynn, Charley Pride, Willie Nelson, Dolly Parton, Emmylou Harris, Garth Brooks and many more — as well as the times in which they lived. Much like the music itself, the film tells unforgettable stories of hardships and joys shared by everyday people. Trailers for the film are available here. A national campaign exploring the history and music through screenings and discussions will take place in more than 30 markets across the country leading up to the film’s premiere. Kicking off the promotional roadshow is a Country Music bus tour along Tennessee Music Pathways with stops and events with local stations and other partners in Cookeville, Bristol, Knoxville, Memphis and Nashville, with a special concert at Ryman Auditorium that will be recorded for broadcast later this year. Among the artists participating in the concert, which will include clips from the film, and be produced by Opry Entertainment, PBS, and Florentine Films are: Dierks Bentley, Rosanne Cash, Rodney Crowell, Rhiannon Giddens, Vince Gill, Brenda Lee, Kathy Mattea, Ketch Secor of Old Crow Medicine Show, Ricky Skaggs, Marty Stuart, Asleep at the Wheel, Holly Williams, and Dwight Yoakam. Bank of America, the corporate underwriter of Burns’s films, is also supporting the concert and the bus tour. “As with so many of their films, Ken and Dayton guide us on a journey through history that educates and entertains, providing an intimate look into the creative lives of those women and men who came together to develop an authentic American art form,” said Perry Simon, PBS Chief Programming Executive and General Manager, General Audience Programming. COUNTRY MUSIC digs deep to uncover the roots of the music, including ballads, minstrel music, hymns and the blues, and its early years in the 1920s, when it was called “hillbilly music,” and was recorded for the first time and played across the airwaves on radio station barn dances. It explores how Hollywood B movies instituted the fad of singing cowboys like Gene Autry and shows how the rise of juke joints after World War II changed the musical style by bringing electric and pedal steel guitars to the forefront. The film witnesses the rise of bluegrass music with Bill Monroe and reveals how one of country music’s offspring — rockabilly — evolved into rock and roll in Memphis. Throughout, the documentary focuses on the constant tug of war between the desire to make country music as mainstream as possible and the periodic reflexes to bring it back to its roots. As Burns and Duncan weave together the musical stories, they connect the history of country music to the larger story of America, looking at how artists and songwriting reflected periods of depression, war and cultural upheaval, and how radio and later television impacted the art form. The series also tells the story of how Nashville came to be not only the epicenter of the country music industry, but Music City USA. At the film’s heart are the stories of unforgettable songs and the artists who created them: their emergence from humble beginnings, their musical influences and their breakthrough moments. The film explores the extraordinary connection between country music artists and fans and notes the enduring influence of particular songs and musicians across generations. The narrative ends in the mid-1990s as a young Garth Brooks emerges from a small venue in Nashville to achieve phenomenal success, brings country music to an entirely new level of popularity, and yet shows up to sign autographs for more than 20 hours at the Country Music Association’s Fan Fair. Duncan, Burns and Dunfey spent eight years researching and producing the film, conducting interviews with more than 100 people, including 40 members of the Country Music Hall of Fame (17 of those interviewed have since passed on). Among those storytellers are historian Bill Malone and a wide range of country artists such as Marty Stuart, Rosanne Cash, Vince Gill, Reba McEntire, Merle Haggard, Dolly Parton, Willie Nelson, Dwight Yoakam, Emmylou Harris, Kris Kristofferson, and Naomi and Wynonna Judd, as well as studio musicians, record producers and others. The film uses more than 3,200 photographs and over two hours of archival footage, including rare and never-before-seen photos and footage of Jimmie Rodgers, Johnny Cash and others. COUNTRY MUSIC boasts nearly 600 music cues over the 16 hours and in the fall of 2019, Legacy Recordings, a division of Sony Music Entertainment will release a comprehensive suite of soundtrack music products timed to the PBS broadcast of COUNTRY MUSIC. Alfred A. Knopf, Burn’s longtime publisher, will issue the companion book, COUNTRY MUSIC: AN ILLUSTRATED HISTORY, written by Duncan and with an introduction by Burns. The 464 page work includes over 400 images, many not seen in the film. In addition, there will be a robust interactive website and an educational initiative designed to engage teachers and students through multiple platforms, including PBS LearningMedia. Viewers are encouraged to join the conversation online using #CountryMusicPBS. COUNTRY MUSIC will stream for free and be available on all station-branded PBS platforms, including PBS.org and the PBS Video App, available on iOS, Android, Roku, Apple TV, Amazon Fire TV and Chromecast. PBS station members will be available to view all episodes via Passport (contact your local PBS station for details). COUNTRY MUSIC will be available on Blu-ray and DVD in September 2019 from PBS Distribution at shopPBS.org. The DVD and Blu-ray extras include a preview program, a behind-the-scenes look at how the film was made and material gleaned from the hours of interviews. The series will also be available for digital download. COUNTRY MUSIC is a production of Florentine Films and WETA, Washington, DC. Directed by Ken Burns, written by Dayton Duncan, and produced by Duncan, Julie Dunfey and Burns. PBS, with nearly 350 member stations, offers all Americans the opportunity to explore new ideas and new worlds through television and digital content. Each month, PBS reaches over 90 million people through television and 30 million people online, inviting them to experience the worlds of science, history, nature and public affairs; to hear diverse viewpoints; and to take front row seats to world-class drama and performances. PBS’ broad array of programs has been consistently honored by the industry’s most coveted award competitions. Teachers of children from pre-K through 12th grade turn to PBS for digital content and services that help bring classroom lessons to life. Decades of research confirms that PBS’ premier children’s media service, PBS KIDS, helps children build critical literacy, math and social-emotional skills, enabling them to find success in school and life. Delivered through member stations, PBS KIDS offers high-quality educational content on TV – including a 24/7 channel, online at pbskids.org, via an array of mobile apps and in communities across America. More information about PBS is available at www.pbs.org, one of the leading dot-org websites on the internet, or by following PBS on Twitter, Facebook or through our apps for mobile and connected devices. Specific program information and updates for press are available at pbs.org/pressroom or by following PBS Pressroom on Twitter. WETA Washington, DC, is one of the largest producing stations of new content for public television in the United States. WETA productions and co-productions include PBS NewsHour, Washington Week, The Kennedy Center Mark Twain Prize, The Library of Congress Gershwin Prize for Popular Song, Latino Americans and The Italian Americans; documentaries by filmmaker Ken Burns, including The Civil War, Lewis and Clark: The Journey of the Corps of Discovery, Mark Twain, The National Parks: America’s Best Idea and The Dust Bowl; and productions by Harvard scholar Henry Louis Gates, Jr., including Finding Your Roots with Henry Louis Gates, Jr. (Seasons Three-Five) and Reconstruction: America After the Civil War. Sharon Percy Rockefeller is president and CEO. The WETA studios and administrative offices are located in Arlington, Virginia. More information on WETA and its programs and services is available at www.weta.org. On social media, visit www.facebook.com/wetatvfm on Facebook or follow @WETAtvfm on Twitter.